Absinthe is a herbal spirit, typically of green colour but it may also be colorless. It has 45–89% alc. by vol. / 90–178 proof. The basic ingredients of authentic Absinthe are wormwood (artemisia absinthium), green anise and fennel. In historical literature it is widely referred to as "La Fée Verte", the Green Fairy. The first known advertisement for Absinthe appeared in a Neuchatel (Switzerland) newspaper of 1769. Suzanne-Margerite Henriod advertised their remedy "Bon Extrait d'Absinthe", which consisted of alcohol, wormwood, aniseed, lemon balm and other herbs. This formula was later modified by a certain Dr. Ordinaire (yes, that was his real name), the inventor of "modern" Absinthe. In 1792 he concocted a formula of 8 plants, including wormwood, anise, hyssop and fennel, and used 136-proof alcohol, which became the traditional proof of real Absinthe. In 1797 the formula was sold to Major Dubied who build together with his son and son in law Mr. H. L. Pernod the first Absinthe factory in Couvet, Switzerland. 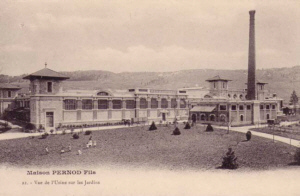 In 1805 a second plant in Pontarlier, France, followed and helped Pernod to gain a fame that lasts until our present time. The commercial breakthrough came about in a curious way. During the Algier War (1844-1847) the French Army made use of the inciting effects of Absinthe and provided the soldiers with regular rations of the liquor. The veterans who had survived the war soon pushed the production output from 400 liters daily (appr. 90 gallons) to more than 20.000 liters (appr. 5.000 gallons) a day and more. Absinthe distilleries started to spread all over France like mushrooms. Artists and intellectuals of those times were the ones especially devoted to Absinthe. Many great works of contemporary art owe their existence to the mystery of the Green Fairy. 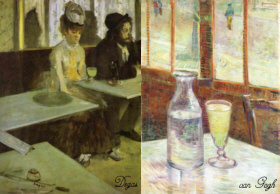 Great names like Baudelaire, Manet, Verlaine, Rimbaud, Oscar Wilde, Degas, Toulouse-Lautrec, van Gogh, Gauguin and Picasso are found among these early adepts of Absinthe. Around 1910 the total turnover of Absinthe distribution had reached immeasurable peaks. The green spirit was as well exported worldwide. Famous Absinthe spots were the Old Absinthe House in New Orleans or various bars in the French colonies around the world. To satisfy the large demand, unfortunately some distilleries made use of low-grade alcohol and in some cases even used copper sulphate for coloration. These irresponsible dealings with the drink together with economical interests of the French wine lobby finally resulted in the prohibition of Absinthe in (almost) all countries of Europe by the year 1920. To be precise, the first country, which banned the Green Fairy was Switzerland in 1910. The French followed in 1915 and Germans on March 27, 1923. In Germany not only the liquor but also the distribution of an recipe to make Absinthe was prohibited. More than half a century had to pass until the production and distribution of Absinthe once again turned legal in the countries of the European Community. Germany was one of the first countries, which lifted the ban. In 1981 the Anti-Absinthe law was annulled. However, this did not change the situation a lot, as the regulations regarding aroma and flavorings still prohibited the use of wormwood oil/thujon. Therefore Absinthe effectively continued to be prohibited. On September 27, 1991, this changed. The legal limit of thujon in spirits with an alcohol degree of up to 25% was set to 5 mg/kg, 10 mg/kg for spirits with up to 25% and 35 mg/kg for bitters. These limits were adopted from the limits set by the European Union in 1988. Outside of the EU, Switzerland legalized Absinthe in the year 2005 and the US followed in 2007 - with some labeling and recipe restrictions. From this date on the cult around this drink has experienced a true revival and leaves Absintheurs all around the world plunging back into the golden times of the 19th century. The Green Fairy is back!